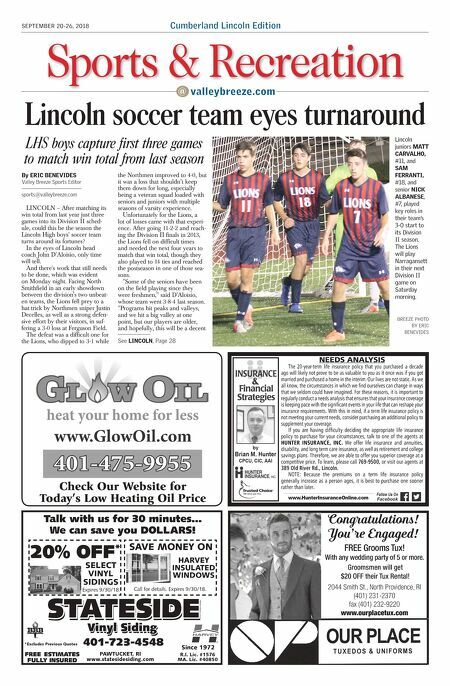 Cumberland Lincoln Edition Sports & Recreation valleybreeze.com @ SEPTEMBER 20-26, 2018 LINCOLN – After matching its win total from last year just three games into its Division II sched- ule, could this be the season the Lincoln High boys' soccer team turns around its fortunes? In the eyes of Lincoln head coach John D'Aloisio, only time will tell. And there's work that still needs to be done, which was evident on Monday night. 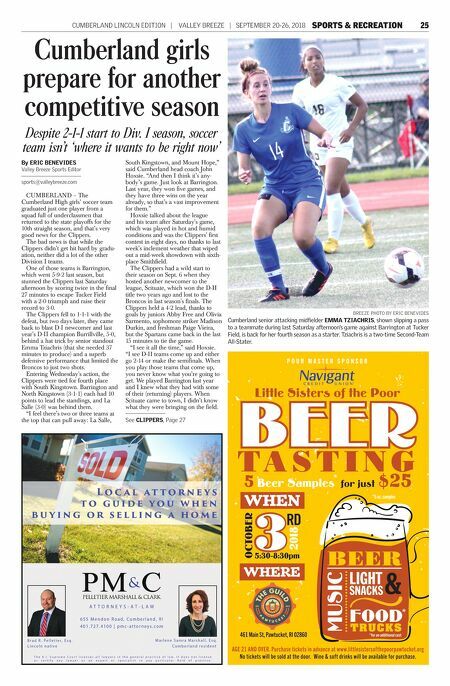 Facing North Smithfield in an early showdown between the division's two unbeat- en teams, the Lions fell prey to a hat trick by Northmen sniper Justin Decelles, as well as a strong defen- sive effort by their visitors, in suf- fering a 3-0 loss at Ferguson Field. The defeat was a difficult one for the Lions, who dipped to 3-1 while the Northmen improved to 4-0, but it was a loss that shouldn't keep them down for long, especially being a veteran squad loaded with seniors and juniors with multiple seasons of varsity experience. Unfortunately for the Lions, a lot of losses came with that experi- ence. After going 11-2-2 and reach- ing the Division II finals in 2013, the Lions fell on difficult times and needed the next four years to match that win total, though they also played to 14 ties and reached the postseason in one of those sea- sons. "Some of the seniors have been on the field playing since they were freshmen," said D'Aloisio, whose team went 3-8-4 last season. "Programs hit peaks and valleys, and we hit a big valley at one point, but our players are older, and hopefully, this will be a decent Lincoln soccer team eyes turnaround LHS boys capture first three games to match win total from last season BREEZE PHOTO BY ERIC BENEVIDES Lincoln juniors MATT CARVALHO, #11, and SAM FERRANTI, #18, and senior NICK ALBANESE, #7, played key roles in their team's 3-0 start to its Division II season. The Lions will play Narragansett in their next Division II game on Saturday morning. By ERIC BENEVIDES Valley Breeze Sports Editor sports@valleybreeze.com See LINCOLN, Page 28 Talk with us for 30 minutes... We can save you DOLLARS! FREE ESTIMATES FULLY INSURED 401-723-4548 PAWTUCKET, RI www.statesidesiding.com R.I. Lic. #1576 MA. Lic. #40850 Since 1972 STATESIDE STATESIDE Vinyl Siding Vinyl Siding 20% OFF * SELECT VINYL SIDINGS Expires 9/30/18. HARVEY INSULATED WINDOWS Call for details. Expires 9/30/18. *Excludes Previous Quotes SAVE MONEY ON 2044 Smith St., North Providence, RI (401) 231-2370 fax (401) 232-9220 www.ourplacetux.com Congratulations! You're Engaged! FREE Grooms Tux! With any wedding party of 5 or more. Groomsmen will get $20 OFF their Tux Rental! Check Our Website for Today's Low Heating Oil Price NEEDS ANALYSIS The 20-year-term life insurance policy that you purchased a decade ago will likely not prove to be as valuable to you as it once was if you got married and purchased a home in the interim. Our lives are not static. As we all know, the circumstances in which we find ourselves can change in ways that we seldom could have imagined. For these reasons, it is important to regularly conduct a needs analysis that ensures that your insurance coverage is keeping pace with the significant events in your life that can reshape your insurance requirements. With this in mind, if a term life insurance policy is not meeting your current needs, consider purchasing an additional policy to supplement your coverage. If you are having difficulty deciding the appropriate life insurance policy to purchase for your circumstances, talk to one of the agents at HUNTER INSURANCE, INC. We offer life insurance and annuities, disability, and long term care insurance, as well as retirement and college savings plans. Therefore, we are able to offer you superior coverage at a competitive price. To learn, please call 769-9500, or visit our agents at 389 Old River Rd., Lincoln. NOTE: Because the premiums on a term life insurance policy generally increase as a person ages, it is best to purchase one sooner rather than later.